← Art Books are Fun, Now Go Play! Teens and Museum Staff think about the future of museums. This summer, fourteen teens from 12 Milwaukee-area high schools came together to impact the present and future of museums. Funded by the MPS Arts Internship Program through the Milwaukee Public Schools Recreation Department, these teens were paid museum studies interns for five weeks, going behind-the-scenes at the Museum, developing career skills, and helping the Museum in its day-to-day functions. They also thought about two framing questions over the course of the program: Where and how do I see myself in the Museum? And: what do museums of the future look like? There’s so much to say about what the teens did this summer, but I think it would be better to let them speak for themselves. Check out the videos below! In this next video, teens talk about how the museum fits into their future. In this last video, teens talk about what they think the future of museums will be like. Because so much activity and thought went into the five weeks leading up to those videos, which are their final reflections, I thought I’d use the rest of this post to share what we did in the internship. The first week focused on the art. We met curators, conservators, registrars, librarians, and more, as well as the Museum Director, Dan Keegan. We also met with a member of one of the Museum’s support groups, a group of volunteers that supports the Museum’s art historical mission. And, we began our weekly “object studies,” in-depth discussions about a single work of art in the Collection. 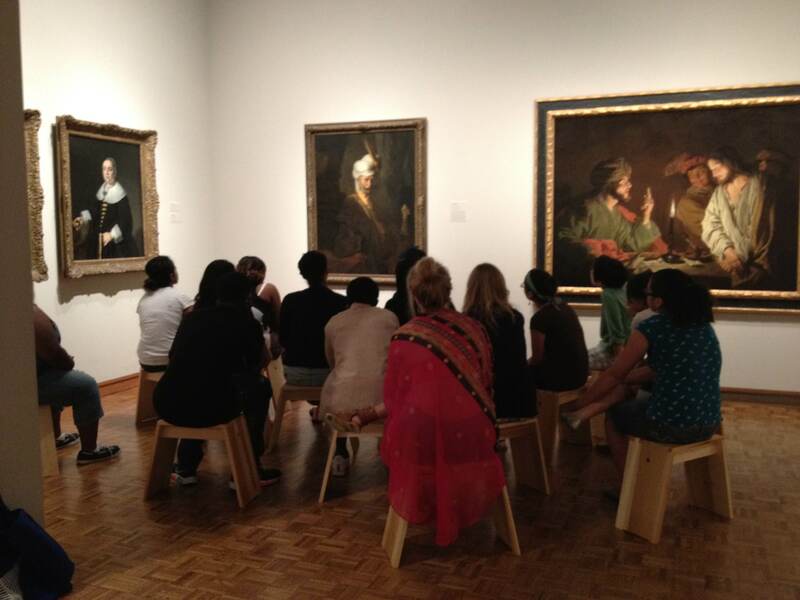 Teens discuss the Ferdinand Bol painting in one of the weekly object studies. 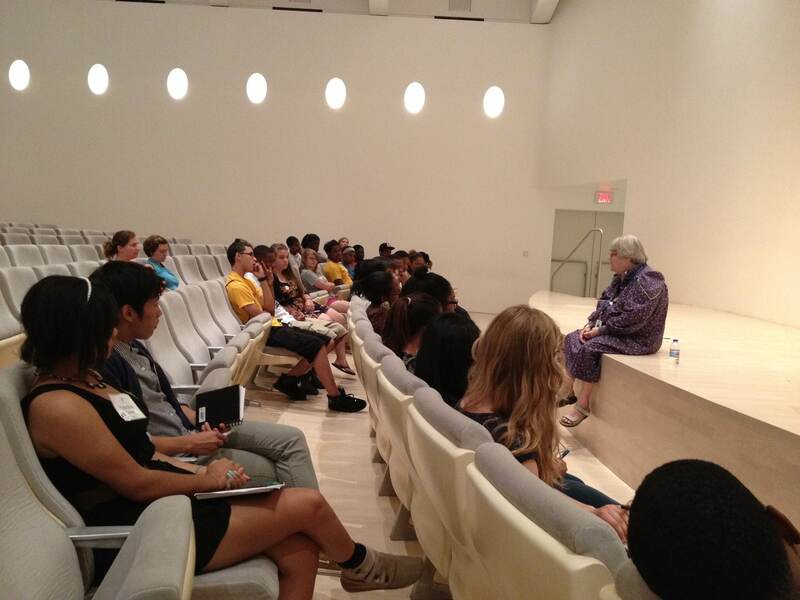 Barbara Brown Lee, Milwaukee Art Museum Chief Educator, talks to the city-wide arts interns. Next, we thought about visitor experience–what is it like from the moment a visitor walks through the door? Teens conducted visitor evaluations to think about how people can play, hang out, reflect, learn, eat and rest, connect, and make art. The teens were split into groups and each assumed a visitor identity–a teen, a family, an older visitor. Some teens even did interviews with visitors to really put themselves in the right shoes. In week 4, the message was our focus: how the Museum communicates with the public about all the art, programs, and experiences found under the wings of the Calatrava-designed addition. The Communications department helps to plan events like MAM After Dark, and the teens were tasked with developing a theme and programming ideas for the December edition of the late-night Museum party. The teens came up with Pajama Jam, and I’m thrilled to say the MAM After Dark Advisory Committee approved it! If you’re in the Milwaukee area, come over on December 7, 2012, to experience the teens’ idea. 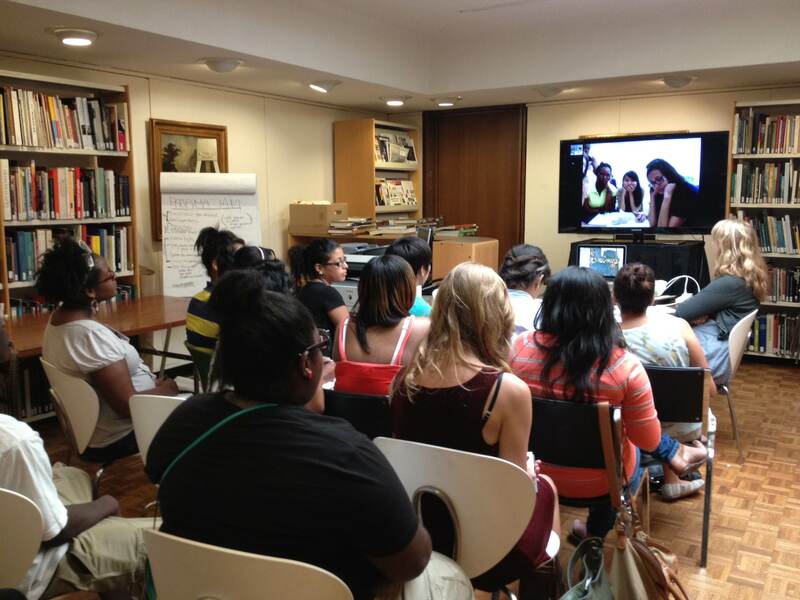 Museum interns had a “Skype date” with teens from the New York City Museum Teen Summit. The weeks went by fast and all of a sudden the summer was nearly over! In the last week, the teens thought about the future of museums. To kick the week off, we had an awesome Skype date with a group of teens in New York City, the Museum Teen Summit, a teen-founded group made of high schoolers in museum programs in New York City. 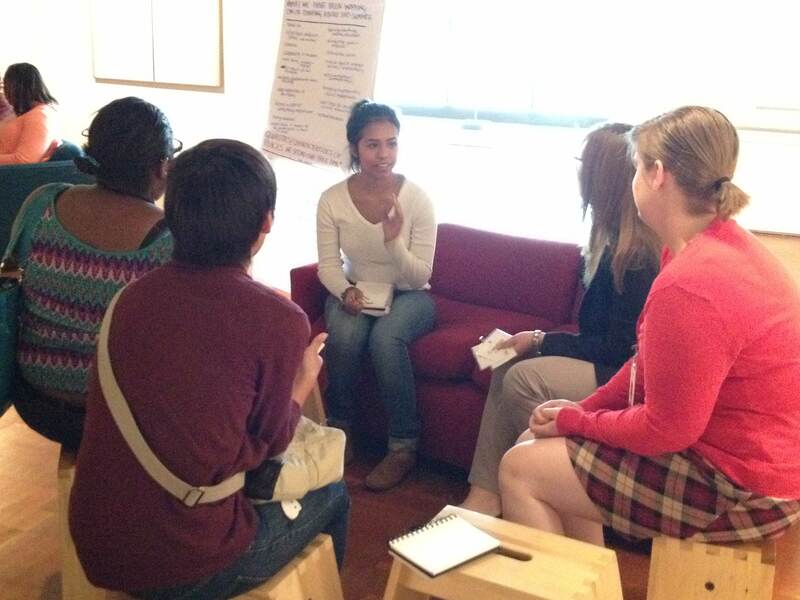 Teens and Museum Staff discuss the future of museums. 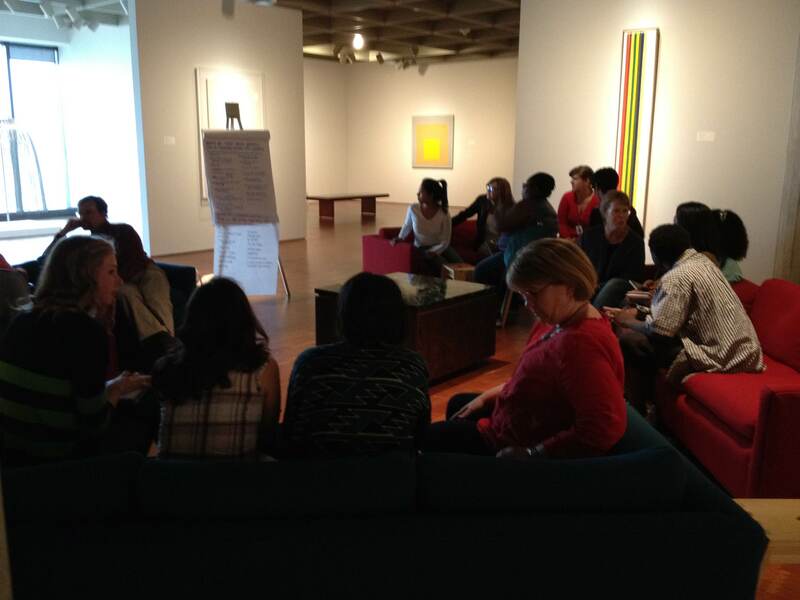 Then we had a mini “think tank” with Museum staff, from curators to educators, to think together about our big ideas, hopes, and dreams for the future. You can see the teens’ reflections on this topic in the video above. 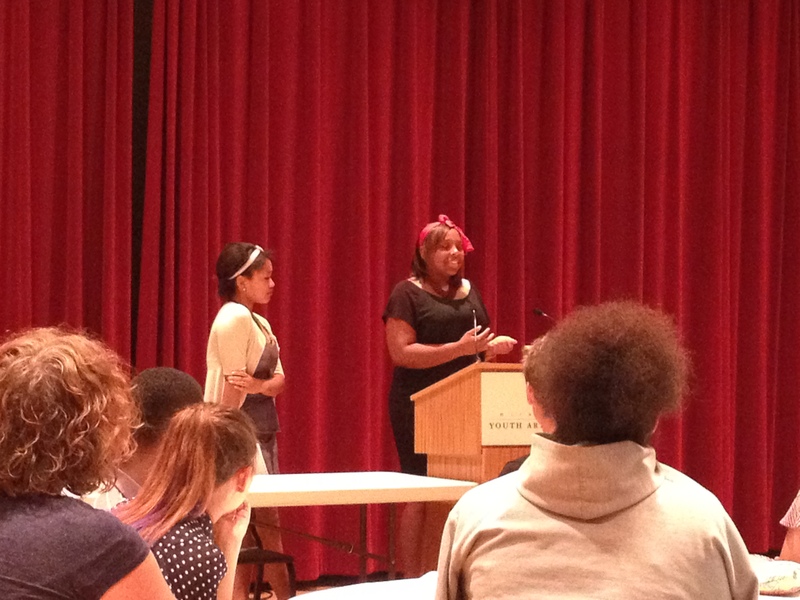 Yasmine and Ana’Nichelle speak at the city-wide arts internship culminating celebration. Many teens also attended a celebratory final event honoring the city-wide arts interns. Yasmine and Ana, above, spoke about their experiences. It was inspiring and invigorating to work with these fourteen young people, who, as you’ve seen from watching the videos, are the curators, educators, directors, marketing professionals, donors, and visitors of the future. Feel free to share your hopes for the future of museums in the comments below! This entry was posted in Behind the Scenes, Education and tagged High School, High School Internships, Interns, Teens. Bookmark the permalink.